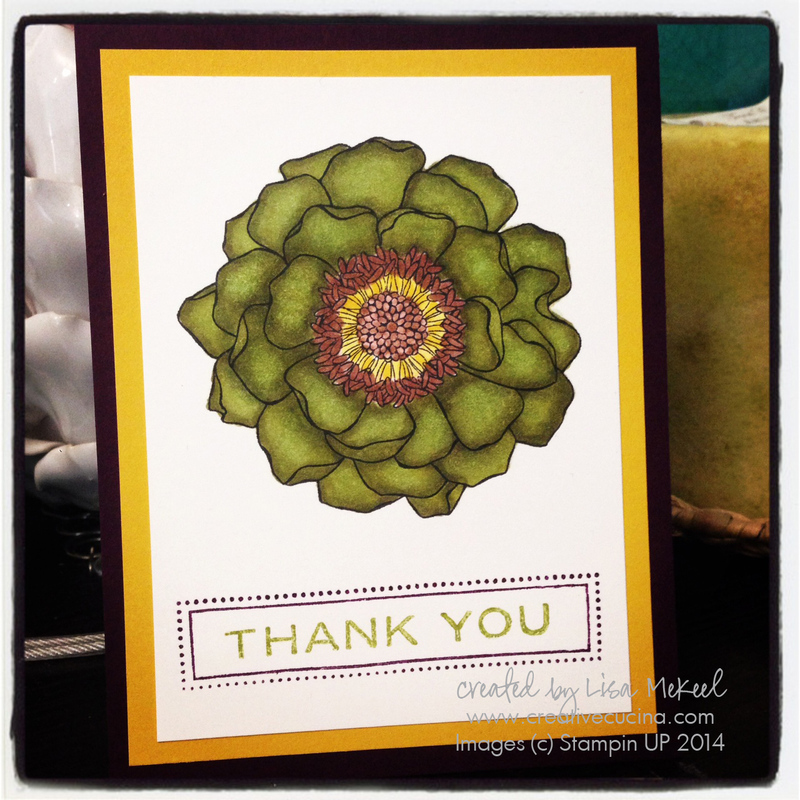 This is a really versatile masculine card–Father’s Day, Birthday, etc. 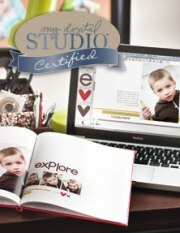 The stamp is called Sail Away from the latest Mini Catalog. For the base, I used Pear Pizazz card stock. 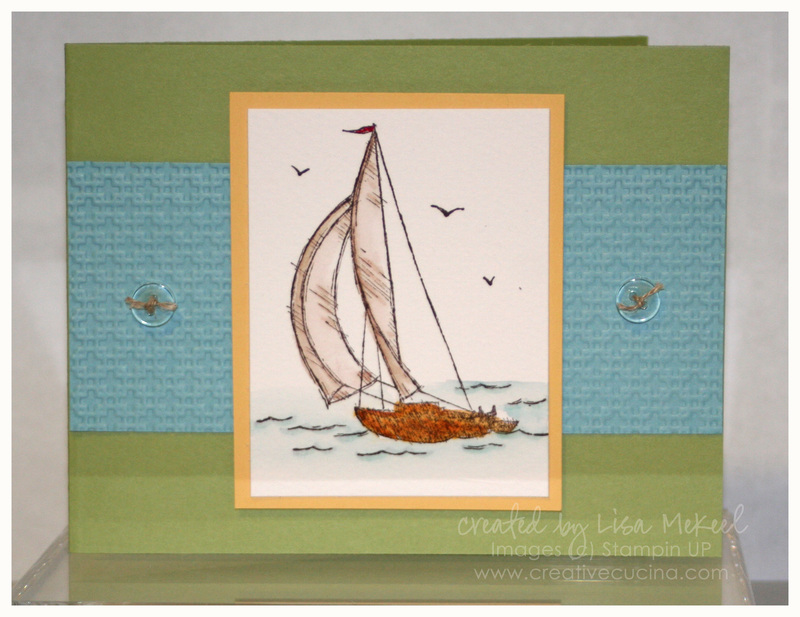 I stamped the sailboat on Watercolor Paper with Brown Stazon ink and then colored the image with Stampin UP Markers and blended them with an Aquapainter. That was layered on So Saffron card stock. 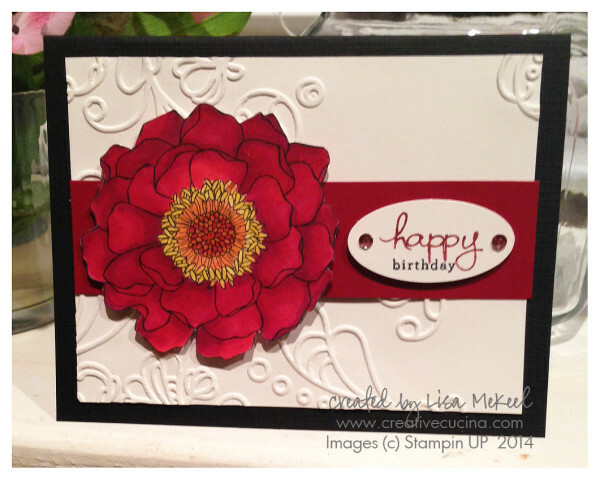 Across the card, I used Baja Breeze card stock embossed with the Square Lattice Embossing Folder and the Big Shot. On either side, I attached clear Bitty Buttons threaded with Linen Thread. For the base, I used Real Red Textured Card stock, layered with Old Olive and Whisper White. The top corners of each layer were rounded with the Corner Chomper, but you could also use the Corner Rounder Punch on the two single layers. 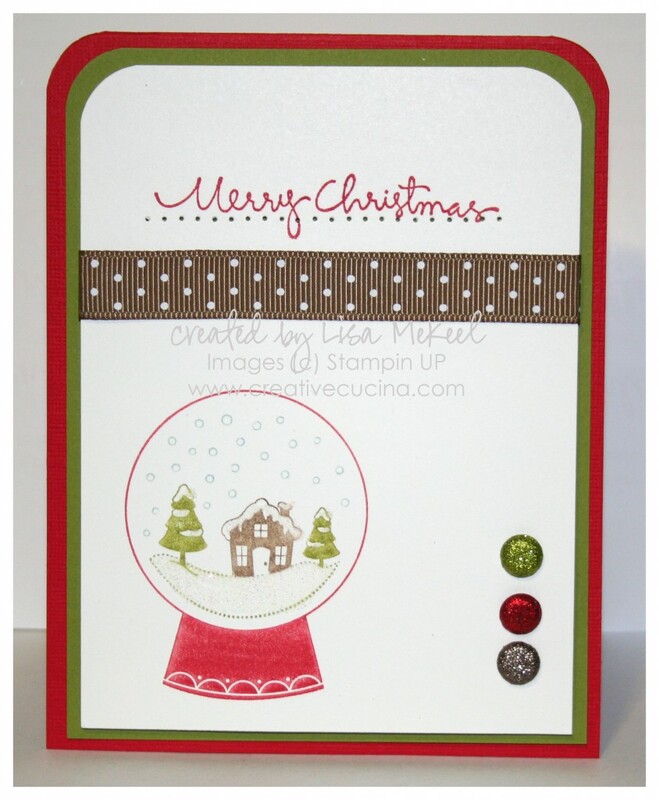 I used the SU Markers to color the snowglobe (Real Red, Soft Suede, Baja Breeze and Old Olive). Then, I added some Dazzling Diamonds to the snowy parts with the 2 Way Glue Pen. To continue the glittery theme, I added 3 Glimmer Brads (in Real Red, Old Olive, and Soft Suede–Brights and Neutrals collection). By using the cropadile, I made sure each brad would be lined up. Across the top, I stamped “Merry Christmas” from Christmas Greetings in Real Red ink, paper pierced below it and added some Soft Suede Polka Dot Grosgrain Ribbon. The White layer is adhered with stampin dimensionals to the base. And yes, I know it’s September and I just made a Christmas card. It’s a sickness!